With the release of her debut EP ‘Love Songs for Bad Lovers’ in 2018, for 2019 Lil will centre back on Bardu as her muse and plans to release another EP based on Norway's dark period. Lil Halima texts me a blue heart emoji before we jump on the phone. Did she choose blue the same way she deliberately chooses colours in every other aspect of her life? “Lately, I’ve been using blue,” she says over the phone from London, where she’ll spend two weeks doing sessions. “I guess it’s a mood.” Actually, colours choose her. It’s not as extreme as, say, synesthesia, but Lil experiences colour in her music. On Nov. 23, Lil’s debut EP titled love songs for bad lovers was released. The cover art sees the 20-year-old Norwegian-Kenyan artist wrapped in a yellow snake. You’d think, then, those love songs for bad lovers is purely happy, but no. “I was feeling very yellow, and then I got into this relationship. I thought everything felt very yellow, and then, it just turned out not too yellow. So, the yellow switched its meaning.” Each song on the EP has threads of different colours. For example, “Jasmine” is “very, very, very red” — evident even to the unknowing eye in the song’s music video, which opens with Lil in a red art studio. Another of the EP’s seven tracks is titled “Bother” featuring Safario, who happens to be her ex with whom she was in that relationship — her first ever relationship. She describes her childhood as generally “really good.” She can’t remember which came first: realising painting as an outlet or realising music as an outlet because it seems she’s been doing both her entire life. Most kids draw and paint, but Lil just never stopped. As for singing, she realised at a very young age that if she started to sing, people would gush over her, and she liked that positive attention. So, she kept singing. About two years ago, her now-manager, Marie, discovered Lil on Instagram. Around the same time, Lil was signed to Def Jam Norway. Without Instagram or social media, in general, the way it is in society now, Lil would still be painting and making music because she was always doing it merely to express herself. 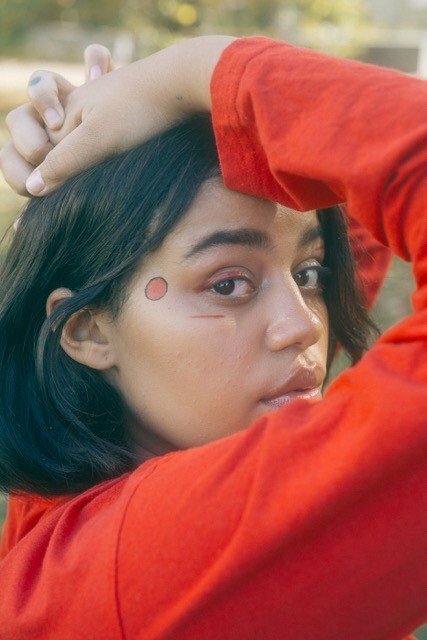 “The thing is everyone told me since I was very little that music should just be my Plan B because it’s so hard to make it and be successful as a musician,” she explains. “But then, I was kind of like, ‘What do you mean?’ because my perception of success has been different from what the people who told me I can’t make it. All of this leads back to Nov. 23 and the release of love songs for bad lovers. In Oslo, Norway, where Lil lived for about a year before deciding to move back home in September, people gathered to welcome the EP into the world — her friends and people she was most familiar with. She played her seven new songs, but the most gratifying part was when her friends sang her songs. In the future, she dreams of having her paintings and music together as an exhibit in an art gallery, but for now, on this night, she couldn’t have asked for anything more. You didn’t forget about “Bother,” did you? No. “Bother” is the key to understanding Lil’s deep appreciation for art and love songs for bad lovers as a whole. She clarifies that having Safario on her EP actually has nothing to do with their previous relationship because regardless of their breaking up, she still really, really loves his art’s sincerity. They had always planned on doing a song together, just “maybe not in this way.” But that’s what artists do: adapt and capture life as it’s happening now, not as how you might have planned. Without her relationship with Safario, and all its imperfections, perhaps love songs for bad lovers wouldn’t have come to be. In describing why she named her EP love songs for bad lovers, she says, “We were not really too good at it, I guess you could say, but it’s also kind of ironic because I feel like you would never tell someone they’re bad at something because they’ve never done it before. So it’s kind of ironic because you’re calling people who have never loved like this before bad lovers. We were not really handling the new being in a relationship thing too well, but at the same time, it’s like, who would do that with their first relationship? The EP is decompression in melodic form. A state of being that Lil has mastered without even trying. Just ask her friends, who tell her, “You’re too chill. You need to stress a little bit.” Case in point: in London yesterday, Lil was trying on pants at a vintage store. Later on, she was frantically searching for her bank card. As she looked through pictures on her phone, she saw proof of herself putting her bank card in the pants she left at the vintage store. Instead of freaking out, she accepted it as fact and moved on. After all, this small-town girl had already lost her bank card in London several times before. She’d rather be back home in Bardu, in the dark season, staring at the Northern Lights.